The movie I picked is Kill Bill Vol. 1, and the game is based on the famous combat scene in the restaurant. Music is based on "White lighting by Crane"
Fun to play. I loved the audio. But the gameplay could've been more improved and polished. All in all, it was good. Well done! Yeah, really had lack of time to work on this entry after all, so I didn't develop all that came to my mind for this game this time, still tried to keep it simple enough to enjoy it easily. I am glad you mentioned the fullscreen note on the game page. I like the SFX and sword animation. It's a pretty fun game. 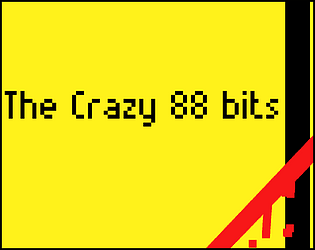 Be sure to check out the other Crazy 88 game that was entered Pico-88 it's another entry based on the same scene! I'll take in consideration all your tips as well as other ones I got from other players. I'll tune the game and will make it a little more challenging as soon as the jam will be over using some of your and other people's feedback and tips. Good job :D Found it a little tricky towards the end as the enemies would approach at the same speed, bunch up and drain my health before I could take them all out. Perhaps adding a little variety to the speed at which each enemy approaches, some faster than others for example, might help. Thanks for the review! Yeah, the game still needs tuning, luckily the code is super parametric, so it's just a matter of time to make it more challening with speed and maybe attack variance. Will work on it! I love the top-down approach, and the music is very close to the original (did you sample it or completely remake it?). Perhaps the enemy attack is a bit slow - but I guess it gets progressively harder, so maybe not. Music is by a friend of mine who actually lives in a whole musicians house, think they did it...yeah I love it too! Saw your game and tried it, it's really amazing! Trying the linux version, it complains of being unable to load ScreenSelector.so. Guess I will have to go find a windows or mac machine to try this. As a side note, it would be nice to have separate downloads for each system. Added a web player edition to let people play while I'll figure out what happened to the linux version, hope you'll try it then! looking forward to it! Thanks!!! Thanks for including the online version! I've finally managed to play it! Good Job!